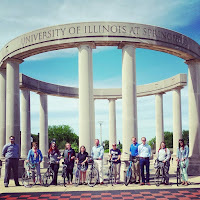 The University of Illinois Springfield has been awarded the Bronze Bicycle Friendly University award by the League of American Bicyclists, joining more than 160 visionary colleges and universities across the country with this distinction. The Bicycle Friendly University program recognizes institutions of higher education for promoting and providing a more bikeable campus for students, staff and visitors. 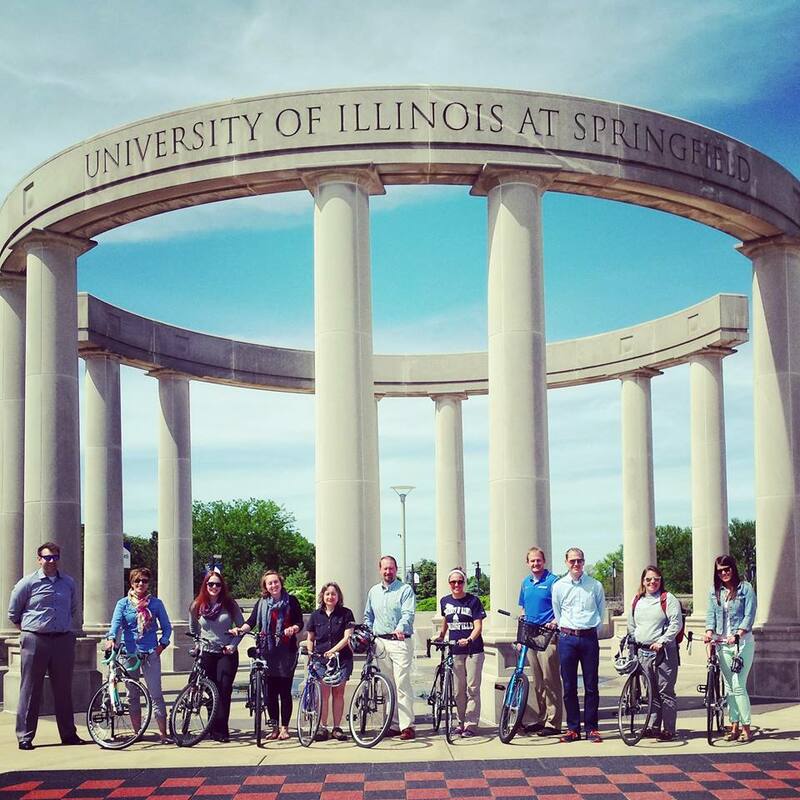 Over the past year, the UIS Bicycle Advisory Committee has developed relationships with the Springfield community to improve bicycling resources for students, faculty and staff. UIS encourages bicycling as an easy option for transportation and provides incentives such as the free STAR Bike Share program for students. Moving forward, UIS will have access to a variety of free tools and technical assistance from the League to become even more bicycle-friendly. The committee’s three goals for the coming year include connecting with local businesses to increase bicycle availability on campus, setting up a bicycle repair station on campus and expanding the number of free bicycles available to students through a relationship with the Midwest Mission Distribution Center’s bicycle repair program. 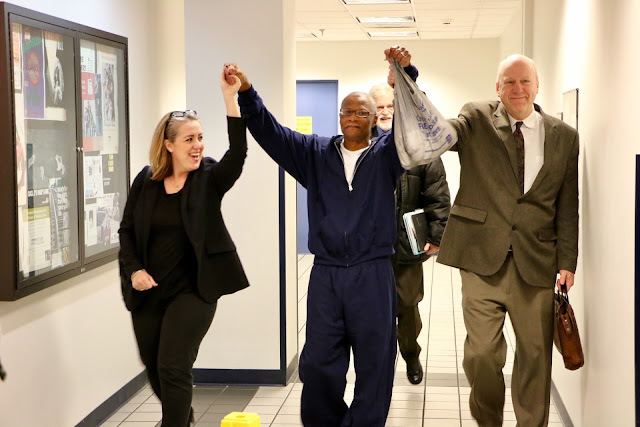 On November 16, a Macon County judge overturned Palmer’s conviction and life sentence for first-degree murder and awarded him a new trial. The Macon County State’s Attorney declined to retry the case on November 23. The case was overturned after DNA evidence, which was never tested by police, including the victim’s fingernail scrapings and hair found in the victim’s hand, was tested by the Illinois Innocence Project. In both cases, the DNA was not a match to Palmer. Helmbacher died in his Decatur apartment after suffering numerous blows to the head with a hammer. Another Decatur man, who lived in an adjoining apartment, became the lead suspect when he was arrested while carrying a plastic bag filled with the victim’s personal possessions. The man initially told the police that he knew nothing about the murder. However, after making a deal for himself whereby the murder charges were dismissed, he gave a statement to the police implicating Palmer. The man also identified a pair of shoes “similar” to those supposedly worn by Palmer the evening of the crime. The crime lab found no evidence on them, though police said the apartment had been awash with blood. The lab returned the shoes to police, who sent them back with the request to “take them apart and check again.” This time, under layers of one shoe, three tiny spots of blood said to be from the victim were found. The evidence regarding these spots of blood would likely be inadmissible by today’s standards. “While the police sent the shoes to the lab twice based on a supposed hunch that they should be examined again, they never sent to the lab even once the key biological evidence that had been collected at autopsy,” said Hanlon. During jury deliberations at the April 2000 trial, the jury sent four distinct notes to the court, asking for every critical item of evidence. The jury also informed the court that they were “deadlocked”, and deliberated for 13 hours before finding Palmer guilty of murder – but not guilty of residential burglary. A motion for DNA testing of numerous items of evidence was filed in 2010 and argued in 2011. The court permitted Palmer to test the fingernail scrapings and the hair but denied testing on all other items. 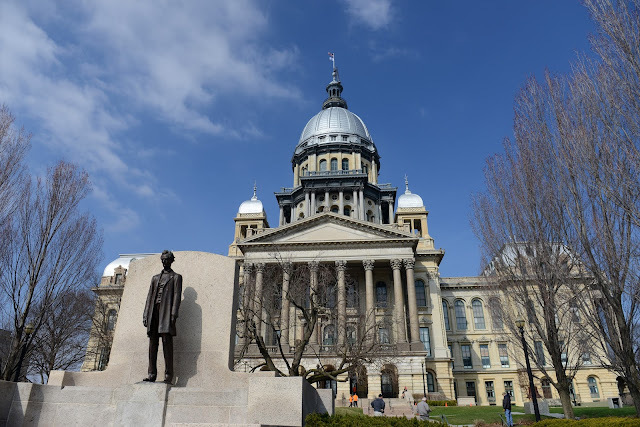 The Illinois Innocence Project, through Hanlon, represented Palmer from 2011 through 2016, filing and litigating a number of motions toward deeper DNA testing of the evidence, and shepherding the evidence through various forms of testing. Illinois Innocence Project Chicago Legal Director Lauren Kaeseberg began assisting with the case in fall 2016. The DNA testing in Palmer’s case was made possible by federal grants awarded in 2010 and 2012 to the University of Illinois Springfield for use by the Illinois Innocence Project. The University of Illinois Springfield has teamed with The Volcker Alliance to help conduct a national multiyear study aimed at improving budgeting and fiscal sustainability in all 50 states. A team of researchers from the UIS Center for State Policy and Leadership, including Public Administration Professor Beverly Bunch, Associate Professor of Economics Patricia Byrnes, and a doctoral student, will gather data on several state governments. Data collected on all 50 state governments by universities across the nation will provide the Alliance with the basis for evaluating state budgeting and financial reporting performance in areas including clarity and integrity. “The Truth and Integrity in Government Finance Project”, as the study is known, will lay the groundwork for governors, legislators, civic organizations, and citizens concerned about fiscal stewardship to effect meaningful improvements in the quality and transparency of state budgets in a time of fiscal stress for many governments. The nonpartisan Volcker Alliance was launched in 2013 by former Federal Reserve Board Chairman Paul A. Volcker to address the challenge of effective execution of public policies and to help rebuild public trust in government. The Alliance is partnering with academic institutes across the United States to complete the study, including UIS. Other partners include Arizona State University; City University of New York; Cornell University; Florida International University; Georgia State University; University of California, Berkeley; University of Illinois at Chicago; University of Kentucky; University of Minnesota; and University of Utah. “The Truth and Integrity in Government Finance Project” is made possible in part by grants from the Peter G. Peterson Foundation and the Laura and John Arnold Foundation. The Alliance anticipates releasing its next round of analysis in 2017, identifying state budgeting and financial reporting practices that need improvement and providing concrete examples of best practices. For more information about the study, contact Professor Beverly Bunch at 217/206-6080 or bbunc1@uis.edu. The University of Illinois Springfield is one of eight institutions that has been awarded a $25,000 Innovation Fund grant from the Coca-Cola Foundation-sponsored competition, “100,000 Strong in the Americas”. The grant was in recognition of education initiatives to create partnerships between higher education institutions, such as UIS, and Latin America; with the goal of increasing study abroad programs in the field of environmental sciences, with an emphasis on water. Keenan Dungey, UIS associate professor of chemistry, was the lead author of the proposal, which also included Michael Lemke, UIS professor of biology; Jonathan GoldbergBelle, senior director of UIS International Programs; Claudia Bonecker, professor of biology at the Universidade Estadual de Maringa (UEM) and Felipe Velho, co-director of the NUPELIA field station of UEM. “This grant will leverage our 10-year collaboration with the Universidade Estadual de Maringa creating additional student research opportunities, sharing our aquatic ecology projects with a broader audience, and contributing to public policy on river management,” said Dungey. The joint project between UIS and UEM will bring together students and faculty from the U.S. and Brazil to study two of the world’s great rivers: the Paraná and the Illinois. Initially nine students and six faculty will be involved in the summer of 2017, with plans to grow the program in future years. It is expected that the eight grants, handed out internationally in 2016, will result in 115 students studying abroad, preparing them to be more globally competent for the 21st century workforce. The University of Illinois Springfield recognized scholarship donors during the 20th annual Scholarship Luncheon on November 3, 2016. Nearly 300 people participated in the luncheon. “These scholarships make a difference and provide the opportunity for students to experience higher education and to become productive citizens,” said Jeff Lorber, UIS vice chancellor for advancement. One of the donors in attendance was Marilyn Lawler, who represented the American Association of University Women (AAUW). The organization currently provides four scholarships to UIS students and hopes to add more in the future. For scholarship recipients, such Crystal Terrazas and Eli Cook, the extra helps means they can focus on their course work without worrying about finances. “I’m so thankful. Words just can’t describe how thankful I am that I was able to receive the scholarship. It helps out so much for me and my family,” said Terrazas. UIS Associate Professor of Management Information Systems (MIS) Dave Larson sees the impact scholarships can have on a student’s performance in the classroom. He’s started his own scholarship to help out students in the MIS program. “Without the financial support, I’m not sure I would have gotten the two degrees I’ve received here,” said Larson. During the event, students got a chance to personally thank their donors and let them know the difference the scholarship has made. “Your investment goes a long way. Investing in students is one of the best investments you can make,” said Cook. Earlier this month, the teams canvassed the neighborhoods and distributed door hangers that explained the project. Collected items were returned and weighed on campus. Prizes were awarded to the teams that collected the most food. Also this year, the UIS Cox Children’s Center participated in the fun by having the children in costume Trick-or-Treat for Canned Goods at on campus departments. 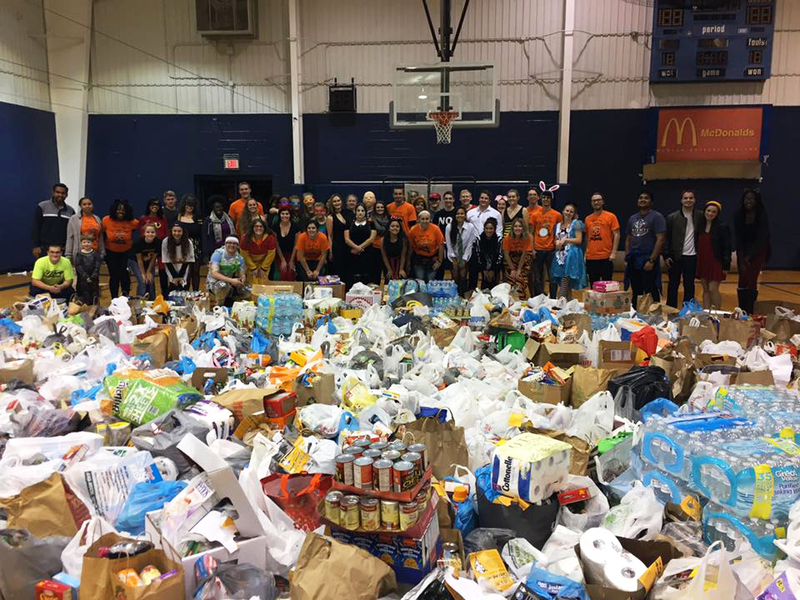 The children collected 365 pounds of food which was donated to UIS Cares, a new food pantry on campus open to all UIS students in need. For more information, or if you have food that was not collected, please contact the UIS Volunteer Center at 217/206-7716 or volunteer@uis.edu.